Note: This extension is included in the Fortify_SCA_and_Applications installer available from Micro Focus Fortify Customer Support. You will need your order or SAID number to download. If you do not know your order number, please contact customer support. 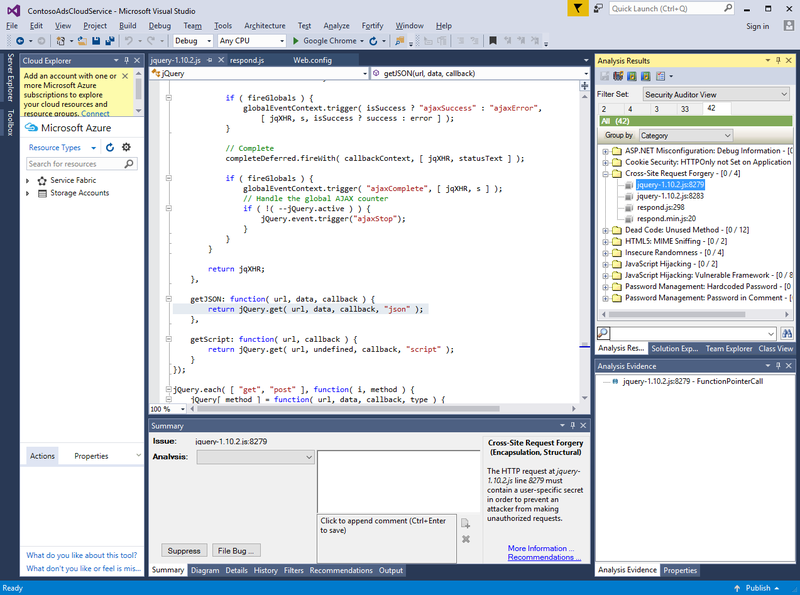 The Fortify Extension for Visual Studio uses Micro Focus Fortify Static Code Analyzer and Fortify Secure Coding Rulepacks to locate security vulnerabilities in your solutions and projects (includes support for the following languages: C/C++, C#, VB.NET, and ASP.NET). The scan results are displayed in Visual Studio and includes a list of issues uncovered, descriptions of the type of vulnerability each issue represents, and suggestions on how to fix them. Your organization can also use the Fortify Extension for Visual Studio with Micro Focus Fortify Software Security Center to manage applications and assign specific issues to developers. You can connect with Fortify Software Security Center to review the reported vulnerabilities and implement appropriate solutions from Visual Studio.